It is an analogue of insulin and this medication belongs to the family of peptide. It is an injectable peptide hormone. DES IGF-1 is ten times more powerful than regular IGF-1 because of its reduced binding to majority of the IGF proteins (high quality agents responsible for altering biological activity). It is structurally different from IGF-1 because of the number of amino acids attached ( 67 amino acids- 3 of them cleaved) governs its effects on human body like cellular growth and development and neurological strengthening abilities. It is known to have a great ability to aid communication of neurons to any cell type. It can effectively benefit elderly people by supporting them with memory loss and Alzheimer disease. This synthetic hormone peptide is highly prized by body builders and athletes because of its capacity to repair damaged muscle tissues. IGF-1 DES binds to the receptor malformed by lactic acid to facilitate tissue growth and upgraded physical performance. Moreover, it finely works against ageing as it enhances the cell reduction. 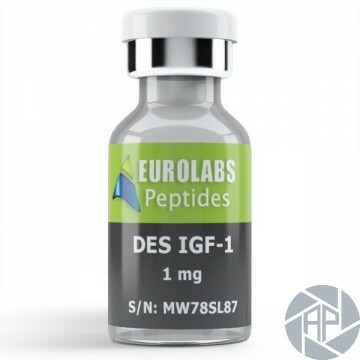 DES IGF-1- 1MG- Dosage and Half-life. 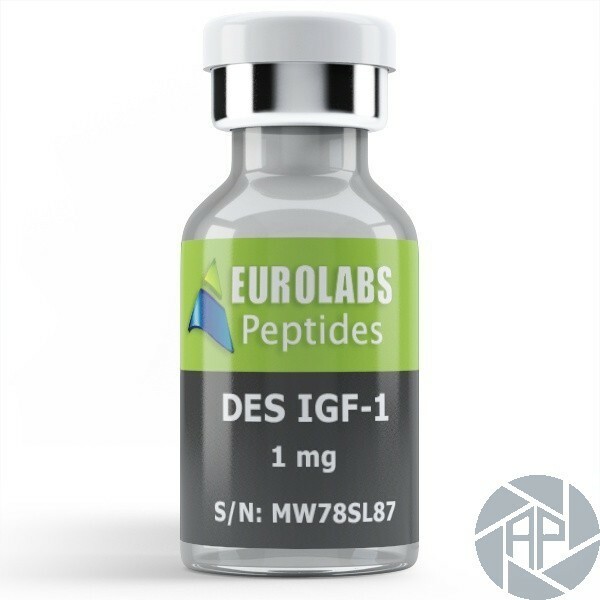 Efficacy of IGF-DES depends not only on the quantity of the dose but the reaction manifested by each individual to that dose is vital. Its half-life is fairly about 20-30 minutes due to which it should be administered frequently. Its effectiveness is site-specific and its injection dose does not promote overall growth. Higher dosages can be applied without having long term side reactions because of its relatively shorter half-life. It is a potent injectable peptide and it must be administered to the localized target muscle that is required to have a specific muscle gain. For example, if you want to see growth in your bicep or thigh, you can inject it directly to that area to have desired bulged out muscle. It can cause low levels of blood glucose which can ultimately cause loss of consciousness, sweating, awkwardness, confusion, palpitations, vertigo and seizures. Go for immediate consumption of carbohydrate (a candy bar or juice) to maintain the glucose levels. DES IGF-1 can increase the risk of cancer because it is proved from evidence that it increases tumor growth and poses a threat for the already vulnerable people. So, it is directed that cancer patients should not use this medication. It must be stored at moderately cool place in your house. Do not refrigerate. Otherwise it has to be kept in an ambient environment to make it suitable for use. Overdose of this hormone can cause facial structural growth specifically in the jaws or possible growth in hands and elbows. Do not take mega doses as it will cause instability in cholesterol levels and heart diseases. Try to take any cholesterol antioxidant supplement and eliminate saturated fats from your diet along with regular cardio workouts.